The topic of good vs. evil is one that I think about quite often. It isn’t something that I really know the answer to and I don’t think anyone will ever be able to articulate it in a way that I will find satisfactory, but I definitely have some strong feelings on the topic. First of all, I didn’t name this article Good VS. Evil for a reason. Good VS. Evil implies that there is this constant epic battle that is happening in this world. That there is Good and that there is Evil, and it implies a sort of black and white type of world. I don’t know about you, but I most certainly don’t experience my life in black and white. I live in a very colourful and vibrant world that has all sorts of tones and shades to it. Having said that, this is where our paradoxical existence lays, we do live in a dualistic reality. So yes, there is good and there is evil….but so what? I’m not trying to be a dismissive jerk about it, I’m just trying say that I don’t see the need to invest time and energy into this perspective that I think can lead myself into a deceptive trap. Why do I see this as a trap? Easy: If I think of myself as “Good” ,and then I perceive other people, institutions and ideas as “Evil”, then I am constantly separating myself from everything around me. I am no longer able to see myself as a part of the world around me, as being connected to everything, if I am seeing everything in my world as being separate. Most importantly though, I believe that we are all of God’s creation. Every single thing in my reality is God. So really, how can anything be Good or Evil? Again, this is a result of our three dimensional existence. It’s very difficult for us to see the really big picture, from a macrocosmic perspective, at all times. We are very much programmed to see things in a dualistic way. Here’s the thing: I believe that we choose to be here, because I believe that we all have freewill (although many of us forget that and therefor lack free-will). 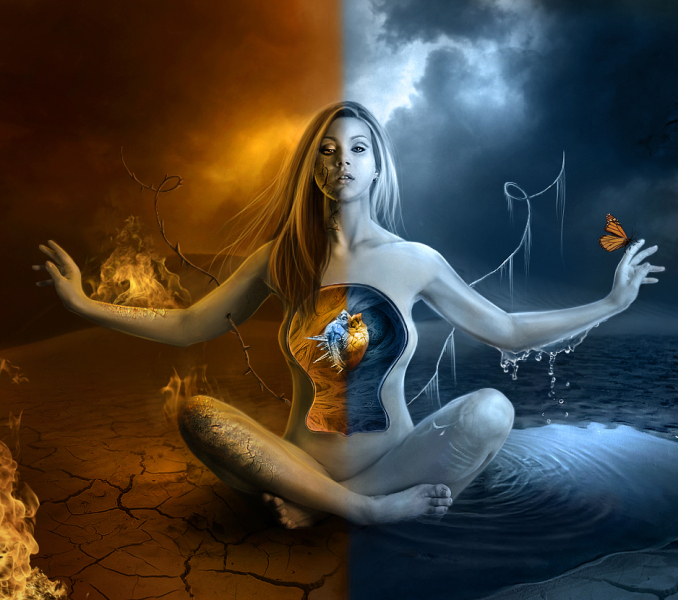 As a soul-being we make the active choice to be born here on Earth, and to be born into this dualistic reality. Living in a dualistic reality means living in a world of contrast. It means living in a world where there is light and dark, love and hate, men and women. Why do we choose to do this? The only answer that I can come up with is that as a soul we have desires to learn and grow. When we are in our soul-body, with no physical form, we can be anywhere we want at any time. We are astral travelling soul beings who are pure light and are always connected to God-Source-Love. When we agree to become a physical form we choose to bind ourselves to the contracts and agreements made for whichever three-dimensional reality we choose to manifest in. In the case of Earth, when we choose to be born here, we agree to manifest into a dualistic reality. We are here to experience and learn. Why else am I here? If Earth was a place where all I experienced was pure light and love at all times, what would be the point of being here? Really, I may as well just die and ascend to heaven. I’m here to learn. I don’t see how I can learn my soul’s lessons unless I live in a world of contrast. This is why I live in a world where Good and Evil exists. If I felt good and happy all the time I simply wouldn’t need to be here anymore. I guess this is where my Buddhist tendencies kick in, because I really believe in the old saying “life is suffering”. To be a human being means to suffer. Guess what? I am completely and totally okay with this. Why fight a losing battle? It’s okay to experience pain. It’s okay to get sick and to die. This is why I am here! It’s actually quite a remarkable and beautiful thing! So I guess what I really want to ask is: Why make a big deal out of this whole Good and Evil thing? It seems more reasonable, to me, to simply accept that I chose to live in this dualistic reality where Good and Evil exists. It is completely impossible for me to be made out of pure light when I have a physical three-dimensional body, and guess what, I have a shadowy dark side to me here on Earth. We all do! Some people see human beings as being imperfect. How can any of us be imperfect if we are all God’s creation? Who do you think created the Devil? God did. When I look at the history of humanity I see a never ending cycle of war between Good and Evil. One group of people determined that another group people were Evil and they sought to destroy and diminish what they thought was Evil. They thought they were Good and that they must rid the world of Evil. They were doing what they thought was the right thing to do. Over and over again we see the same story and hear the same rhetoric. Tell me, who is really winning? Is it Good or is it Evil? No one is winning. So this is why I ask: why do we invest so much into this? In the end we just end up fighting with ourselves. We do the same thing to ourselves. We don’t like parts of ourselves and we determine different aspects of ourselves to be good or bad. We love it when we make people smile and hate ourselves when we make people cry. We are at war with ourselves. I feel tired of fighting with myself. I feel like I am reaching a new level of self-acceptance for myself where I no longer wish to fight myself. I just want to love myself – every single part of myself – the way God loves me. Am I saying that we should allow people to do “bad” things to us? Am I saying that we should allow world leaders to make decisions to harm lots of people and harm the planet? Am I saying that we should let people bully us around? Hell no! Despite the inevitable suffering that I experience in life, I believe in quality of life. I still want to enjoy life to the fullest, and I think that every human being has the right to have a quality, joyful experience here on Earth. I can’t do anything about the people who choose to have a miserable experience on Earth, but I have every right to ensure that they don’t bring their miserable business into my own existence. I am a being of Light that was born out of the darkness of the Void. This entry was posted in Blog, Faerie Reading and tagged buddhism, conflict, darkness, evil, Good, light, love, suffering, void, war by faeriemessenger. Bookmark the permalink.